Why Import a Boat from the USA to Australia? 10 times more boats to choose from than currently available in the Australian market – both early and late models! Searay, Bayliner, Silverton, Wellcraft, Carver, Four Winns, Rinker, Hatteras, Boston Whaler and other quality branded boats from our trusted USA boat dealers network! Preowned USA made boats typically include lots of extra marine accessories such as high end electronics, satellite, radar, air conditioning, generators and more, retaining their value and in most cases increasing in value landed in Australia! Many American pre-owned boats have only cruised fresh water lakes and dams! Can be delivered to the Australian Marina location of your choice! We can move any sized boat from fishing vessels, cruiser class and deck boats, houseboats, to sail and luxury motor yachts! 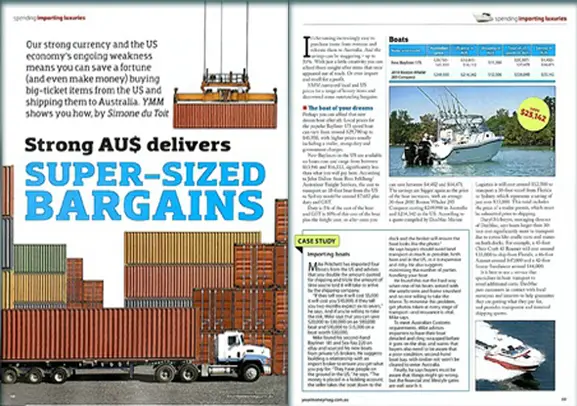 Freighting of smaller class used boats such as Skeeter, glastron and Stratos boats and runabouts also available – share a container and halve the freight cost! Second-hand Ski boats including Malibu & Tige! We can also ship inboard and outboard motors and quality marine accessories!